A knitter, the founder of Heal My Hands, found the very rough skin on her hands was catching on her work as she knit. So she spent months developing something to moisturize and soothe them...and created her own company! The products are all natural, rich in lanolin, with no preservatives or chemicals, and come in little cakes, stored in their own pretty tins. You pop out the cake and rub it between your hands...and you're advised to allow time for the moisturizer to soak in to your skin [and apply it to your feet only at night immediately before bed to avoid slipping mishaps]. Each cake can last from 1-4 months, depending on how dry your skin is and how often you use the product. Friend S [lavender mint]: It smells really nice. I usually prefer unscented stuff, so I really mean it. It really makes my hands soft. It absorbed into my skin faster than I expected. I've only used it before bed. The lavender is a nice sleepy-time smell. I'm not crazy about the application though. It's weird to rub this on my hands like a bar of soap, and I can't apply it directly to trouble spots like my cuticles very well. 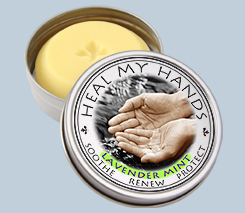 Friend K2 [lavender mint]: I like the stuff, although when i first put it on I wasn't so sure. It's very solid and it didn't seem like a lot was getting onto my skin since there was very little "slippage". But that quality made it stay on through the night, and in the morning my hands were noticably softer. I absolutely love the fresh smell, too. Friend K1 [ultra]: It's definitely working. I'm using mine on my heels too (because of the arnica) and it's working wonders there. I have really dry hands, usually, and they've been smooth and soft during the day even though I'm only using it before bed. I really like the smell - interesting but pretty, definitely scented but subtle. The packaging rocks. However, it seems to be going really quickly. I've used at least a quarter of it in very few applications. I would use it in conjunction with my regular hand lotion rather than instead of. Friend J [unscented]: I used it for only two nights on my hands. There is a very slight improvement to my skin. While it soaks in as everybody says, I can't hang around at night with greasy hands when I go to bed because I need to shift the baby about and I don't really want to cover him with beeswax. If I was going to use it long-term, I'd stop putting the lid on it. I'd just leave it out, lidless, like a cake of soap because otherwise my greasy hands would make the lid all slippery. If I had rough hands and needed a cure, out of everything I've ever used so far, I'd reach for this. I'd only use it as a course of treatment, not as a nighttime ritual. Knitting for charity is, thankfully, continually popular. 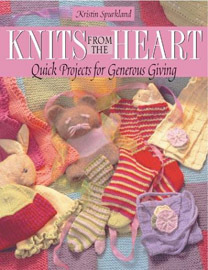 And as a knitter, you often want to make something special to donate...or as a quick gift. If you do this often, this book is worth a look! Kristin Spurkland's first book, full of quick and satisfying projects, is dedicated to a no-kill cat shelter, the House of Dreams in Portland, OR. Inside you'll find blankets, scarves, accessories, toys and other sweet delights. They're all quick knits [some are quicker than others] using a variety of techniques. I love the little felted animal puppets, and I can think of at least one nearly 5-year-old who'd love the Embossed Heart Scarf. 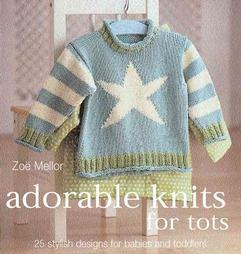 I'm a non-mom by choice, and I have few kids to knit for, but Zoe Mellor's latest makes my ovaries ache. There is nothing cuter than almost every pattern in this book. Pretty colors. Classic, non-cutesy motifs. Adult-inspired styling. This book attempts to do what people like Ann Budd have done quite well...create a library of customizable patterns. But this one takes an easier-to-visualize approach. It's a spiral-bound flip book. The top section holds the body patterns, nicely photographed [samples knit in Rowan yarns] and clearly laid out...you'll find a variety of neck and body shapes, textures and patterns. The bottom of the flip section holds sleeves and collars. It's a really clever concept. There are two things that restrict the book's audience, however: all patterns are in DK-weight yarn. This means it's easy as pie to use whatever DK-weight yarn you want. Use a different gauge, though, and be prepared to pull out your calculator. The other significant restriction is that the patterns go up to a size large...which the author has assigned to a finished measurement of 40". If you're a small person, this is of no concern to you. To more than half the North American female population, however, it makes the book of little value. The three oversized sweaters in the book [in the 49" range] aren't as pretty as many of the other designs and are, unfortunately, mostly shapeless. 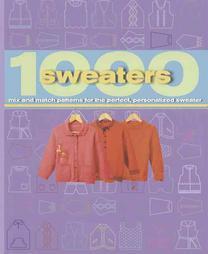 I like the tools this book provides you with quite a lot, but I suppose I'd have liked it more if it had been labelled "1000 sweaters in DK weight for women size 12 and smaller". If the author continues the series with a new edition that includes larger sizing, I'd say she's got a winner. The cover scarf on this book makes me eat my words. Now, I wish I could say that everything in this book is as creative and innovative as the cover scarf. Sadly, no. But some of them ARE. 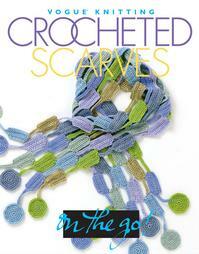 And if you're desperate for something fun to crochet, I'd leaf through this book. It just might be the answer to your hooky prayers. Do you have cool stuff you'd like to see reviewed in Knitty? Write Amy.